OpenCart is one of the more popular web applications for e-commerce out there. Its user interface is quite comfortable to learn for any new e-store administrator. It also does not use too many active server resources, therefore the script is widely accessible across many hosting platforms. 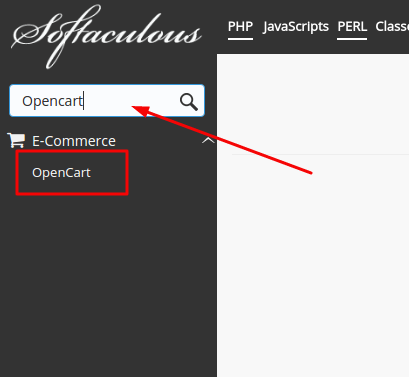 In this tutorial, we will use the easiest way to install OpenCart – using Softaculous App auto-installer. Softaculous App installer can usually be found within your host’s control panel interface (cPanel/whm, Webuzo, etc.). Try looking specifically for Softaculous Apps Installer option. Once you click on it, the following window will present you with a full overview of the OpenCart application, including its current version, disk space requirements, and various feature demonstrations. Now in order to proceed with the installation, click on Install Now. The next panel will present you with the following sections: Software Setup, Store Settings, Admin Account and Advanced Options. Choose the version you want to install – In this option, you can choose which version of the app you wish to be installed. Choosing the newest version is always recommended as it will provide you with the most up-to-date feature and security. Choose Protocol – Here you can choose what URL extension your app will use by default. If you have an SSL certificate installed on the account, you may want to use https:// extension since it would provide encrypted and more secure access. If you do not have SSL, do not worry! Use http:// or http://www option instead. Choose Domain – Choose the domain name you wish the app to be installed onto. In the example, I have chosen a newly created subdomain. Keep in mind that you can also create a subdomain of your own via cPanel – Subdomains section. In Directory – This field will specify in which directory path the app will be installed. For example, if I entered myfolderin this field, my OpenCart website would be located at opencart.somuv.eu/myfolder path. If you want it to have no additional subfolders, just leave it blank, like I did in the example. All of this information will depend on your own preference. These values will not affect the installation process itself and you will be able to change them at any point after the installation. Admin Username & Password – Admin credentials will be used to access OpenCart’s backend (administrator area). It is advisable to use a strong password here since it would present you with a high-risk vulnerability otherwise. Admin Email – Feel free to use your own contact email address as this is where all the update/backup notifications will be sent. Also, if you were to misplace admin area password, this email would be used in order to recover it. First & Last Name – This information will not be publicly displayed, so entering your real name will not present you with any privacy issues. This panel is optional and it would be best to leave it as it is. However if you wish to have customized database name and database table prefixes, feel free to change them to your liking. You can also setup automated backups system here, but before doing that, make sure your hosting account has enough disk space to support its constantly growing usage. Once you are comfortable with all the details you have entered, click Install. If you see a similar page, it means that the installation was successful. Good job! Congratulations! You have now taken your first step towards creating a new successful web store! We have covered the base understanding of how Softaculous auto-installer works and what initial details are required in order to install a fresh copy of OpenCart application. Now you can proceed with the creative part – designing and developing your website!